The feature film “Monuments Men” gives educators a wonderful opportunity to teach about this fascinating effort by the US forces under Gen. Dwight Eisenhower to rescue the art treasures of Europe. See the resources below, as well as our Featured Document and Featured Video selections on this topic. Commission for Art Recovery (Ronald Lauder) – Click on Resources to find links to many websites with policy papers and other information about looted art. Monuments Men Education – The site has lesson plans, videos and more. 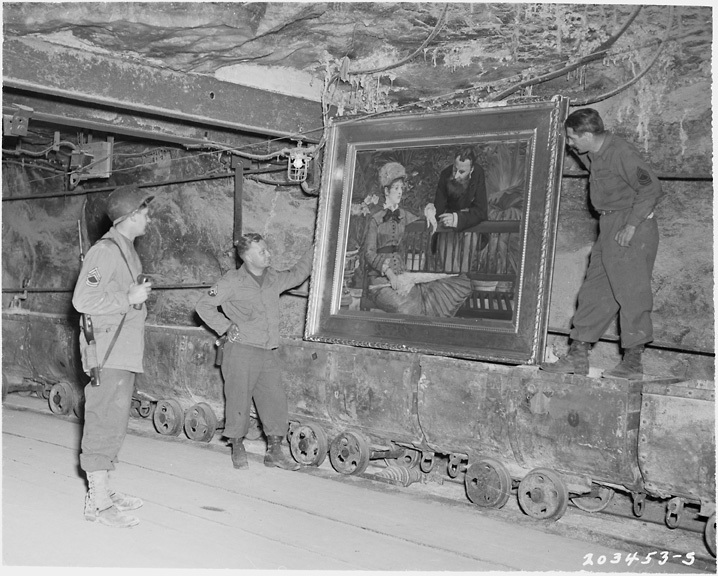 Not All Monuments Men Were Men – Article in the New York Times about women civilian art experts who accompanied the male team to rescue stolen art in Germany during the war. Monuments Men Foundation YouTube Channel – Twenty-two videos about the Monuments Men, including historic films and later interviews. 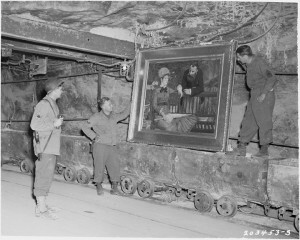 National Archives Holocaust-Era Images : A collection of photographs depicting US soldiers examining art stored in German salt mines and castles. Alfred Rosenberg Diary at USHMM – Rosenberg was the head of the “Einsatzstab Reichsleiter Rosenberg” [Task Force of the Reichsleiter Rosenberg, or ERR], which led the effort to plunder the art treasures of Europe, shipping more than one million railroad cars of artwork and artifacts to Germany by war’s end. See also the article on Rosenberg.